FRED F. BRYANT v. BOSTON ELEVATED RAILWAY COMPANY & another. Present: RUGG, C. J., BRALEY, SHELDON, & DECOURCY, JJ. Negligence, In use of highway, Street railway. that the street car tracks turned sharply to the left on the intersecting street; that, at a signal from the policeman, the car and the team proceeded forward, the car moving a little faster than the team; that the driver of the team intended to continue across the intersecting street and, in order to do so, had to turn somewhat to the left to pass around a building which projected into the street from his right about opposite the curve in the tracks; that as the car rounded the curve the rear vestibule swung out, caught the front hub of the wagon and pushed the wagon and the horse so that the horse struck the plaintiff who was on a sidewalk and injured him. Held, that there was evidence upon which the jury might have found that the plaintiff's injuries were caused by concurrent negligence of both defendants. TORT against the Boston Elevated Railway Company and the New York and Boston Despatch Express Company for personal injuries sustained on April 1, 1905, when, as the plaintiff was on the sidewalk on State Street in Boston and just emerging from the archway for pedestrians at one end of the Old State House, he was struck by a horse which was hitched to a wagon of the defendant express company, the wagon and horse having been pushed by a car of the defendant street railway company. Writ dated April 10, 1905. In the Superior Court the case was tried before Brown, J. On the following page is a reduction of the main features of a plan which was introduced in evidence. 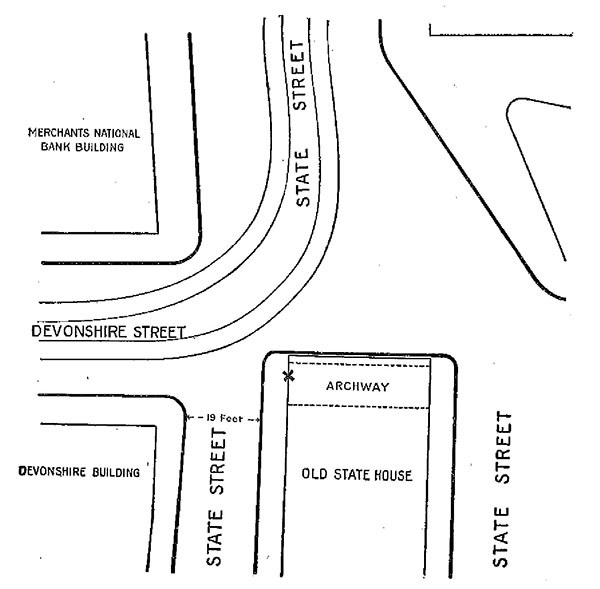 There was evidence tending to show that a car of the defendant street railway company was proceeding on the right hand track on Devonshire Street toward State Street; that nearly abreast of it and proceeding with about equal speed was the team of the defendant express company; that a police officer was standing between the street car tracks at the point where Devonshire Street enters State Street; that on the policeman's signal the car and the team passed him slowly, the car a little in the lead; that it was the intention of the driver of the team to turn enough to the left to continue past the end of the Old State House down Devonshire Street; that, as the car rounded the curve into State Street, the rear vestibule caught the front left hand hub of the express wagon and pushed the wagon forward, and that, although the driver of the team pulled back hard on the reins, the horse was pushed against the plaintiff, who was just coming out of the archway at the point marked with a cross on the plan, and the plaintiff was knocked down and rendered unconscious. Elevated Railway Company rested its case, and at the close of all the evidence the judge ordered a verdict in its favor; and the plaintiff excepted. At the close of all the evidence the defendant express company asked the judge to rule that the plaintiff could not recover against it. The ruling was refused and the express company excepted. the Boston Elevated Railway Company jointly with the other defendant for the amount of the verdict." W. C. Cogswell, for the plaintiff. M. J. Sughrue, for the Boston Elevated Railway Company. H. F. Hurlburt, Jr., (C. A. Wilson with him,) for the New York and Boston Despatch Express Company. BRALEY, J. The plaintiff while upon a public way as a pedestrian without any reasonable cause to apprehend that his position might be unsafe was struck, knocked down, and rendered unconscious by a wagon driven by a servant of the defendant express company. If the combination of circumstances which produced the injury may be infrequent, they are not extraordinary, and, the issue of this defendant's negligence having been a question for the jury, the refusal to order a verdict in its favor was right. Powell v. Deveney, 3 Cush. 300. Slattery v. Lawrence Ice Co. 190 Mass. 79. Hanley v. Boston Elevated Railway, 201 Mass. 55, 59. Dulligan v. Barber Asphalt Paving Co. 201 Mass. 227, 231.
daylight the motorman and the driver after a signal from the officer that they could proceed, moved forward, and the car going at greater speed outstripped the wagon. The projecting rear end of the car in passing swung over the roadway, and coming into collision with the wagon forced it over the sidewalk, where it felled the plaintiff. It was the duty of the motorman to have stopped the car if he saw that the driver had determined to go on, and it was the duty of the driver not to have attempted to pass the car and turn to the left until the car had passed him, and if either the motorman or the driver had acted with ordinary prudence the collision would have been averted, and the injury to the plaintiff would not have happened. Carrahar v. Boston & Northern Street Railway, 198 Mass. 549. Wright v. Boston & Northern Street Railway, 203 Mass. 569, 570, 571. The plaintiff having offered abundant evidence that his injuries could be attributed to the concurrent misconduct of the defendants, he can recover judgment against both, although he can have but one satisfaction in damages. Feneff v. Boston & Maine Railroad, 196 Mass. 575, 581. By the terms of the report judgment is to be entered on the verdict for the plaintiff against both defendants.